By finding patterns of varying lengths and magnitudes, the trader can then apply Fibonacci ratios to the patterns and try to predict future movements. 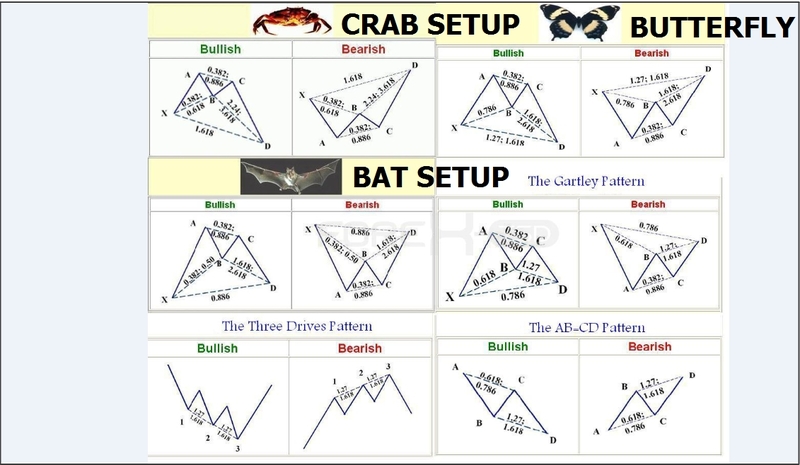 The trading method is largely attributed to Scott Carney, although others have contributed or found patterns and levels that enhance performance. Harmonic price patterns are extremely precise, requiring the pattern to show movements of a particular magnitude in order for the unfolding of the pattern to provide an accurate reversal point. A trader may often see a pattern that looks like a harmonic pattern, but the Fibonacci levels will not align in the pattern, thus rendering the pattern unreliable in terms of the Harmonic approach. This can be an advantage, as it requires the trader to be patient and wait for ideal set-ups. Harmonic patterns can gauge how long current moves will last, but they can also be used to isolate reversal points. The danger occurs when a trader takes a position in the reversal area and the pattern fails. When this happens, the trader can be caught in a trade where the trend rapidly extends against them. Therefore, as with all trading strategies, risk must be controlled. It is important to note that patterns may exist within other patterns, and it is also possible that non-harmonic patterns may (and likely will) exist within the context of harmonic patterns. These can be used to aid in the effectiveness of the harmonic pattern and enhance entry and exit performance. Several price waves may also exist within a single harmonic wave (for instance a CD wave or AB wave). Prices are constantly gyrating; therefore, it is important to focus on the bigger picture of the time frame being traded. The fractal nature of the markets allows the theory to be applied from the smallest to largest time frames. A crossover resulting from a security’s long-term moving average breaking above its short-term moving average or support level. As long-term indicators carry more weight, this trend indicates a bear market on the horizon and is reinforced by high trading volumes. Additionally, the long-term moving average becomes the new resistance level in the rising market. A crossover involving a security’s short-term moving average (such as 15-day moving average) breaking above its long-term moving average (such as 50-day moving average) or resistance level. As long-term indicators carry more weight, the Golden Cross indicates a bull market on the horizon and is reinforced by high trading volumes. Additionally, the long-term moving average becomes the new support level in the rising market. Technicians might see this cross as a sign that the market has turned in favor of the stock. 1. The first candle in the pattern is a long red candlestick within a defined downtrend. 2. A series of ascending small-bodied candlesticks that trade within the range of the first candlestick. 3. A long red candlestick creates a new low, which suggests that the sellers are back in control of the direction. The series of small-bodied candlesticks are regarded as a period of consolidation before the downtrend is able to continue. This pattern is important, because it shows traders that buyers still do not have enough conviction to reverse the trend and it is used by some active traders as a signal to add to their short positions. ==== Definitely One of the Best Quotes for Trading – Simple & Beautiful! . For those that don’t have a trading plan, look no further! Lolz 🙂 . This is a 5 Step Process for Trading and more! 1. Measurement – I would see it as to complete beforehand all your technical & fundamental analysis in the Monthly, Weekly , Daily, 4 hrs, 1hrs ,30 min Time-frames to see the big picture , the “conditions of the battlefield”. 2. Estimation of Quantity – How many Troops will you deploy , where & why? Great money management is the key here. Money management as a per troop basis is a great way to “see” and “feel” your risk. This must be thought before the battle begins and used when the battle is fought! 3.Calculation – For me it is the entry / exit strategy to implement (setups). When is the most favorable moment to deploy your troops, if you know what I mean? 4. Balance of chances – Sounds similar but different in my eyes, I would ask myself if the probabilities are on my side. This is where I would do a Probability chart study analysis. What do you think? What do this quote mean for you? Any comment or experiences you would like to share? Double tops and double bottoms come in four varieties (the links take you to the bottoms): Adam & Adam,Adam & Eve, Eve & Eve, and Eve & Adam. Each peak or valley is either wide or narrow. Wide ones are called Eve and narrow ones are called Adam. But what is wide and what is narrow? Answering that can be confusing for both novices and experts alike. Sometimes a chart pattern can be difficult to assess. However, I’ve created some identification rules. 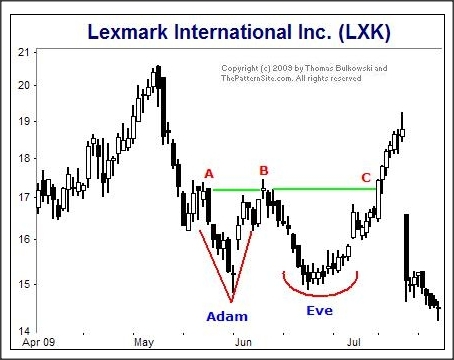 Let’s discuss Eve bottoms and I show one in the chart of Lexmark (LXK) on the daily scale. Eve is wide, rounding appearing. If it has downward spikes, they are numerous and often short. Notice how the top of the Eve bottom is very wide. I denote that with a green line between points B andC. Compare the width of BC with AB. Notice that the Eve bottom is much wider at its top than is the Adam top. That is one of the key ways of telling an Adam bottom or top from an Eve. 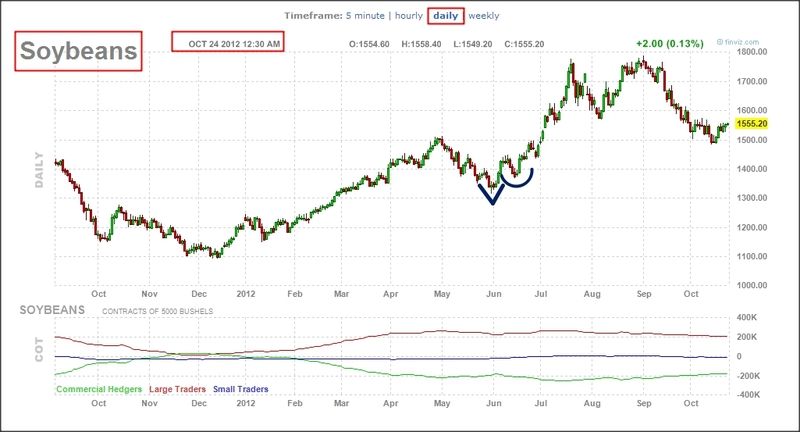 Adam peaks or valleys are narrow and remain slender as you move up (bottoms) or down (tops) the pattern. Often Adam will be composed of one long spike. Recall that Eve can have spikes, too, but they will be numerous and often short. Adam will have one or two and be quite long. The Adam bottom pictured in the chart shows such a long spike. The chart shows, of course, an Adam & Eve double bottom. Imagine the same picture flipped upside down. The Adam and Eve peaks would retain the same characteristics. Eve peaks are wide and rounded appearing but Adam peaks are slender and pointed. To make identification easier, ask yourself if the two peaks or valleys look the same or different. If they are the same, then you are dealing with Adam & Adam or Eve & Eve. If one is wide and the other is narrow, then it is either Adam & Eve or Eve & Adam. (pictured) discusses the details of Adam and Eve tops and bottoms. The various combinations behave differently so that if you can identify them correctly, you can use that information to your advantage. Eve & Eve double bottoms, for example, tend to be star performers. Tests show that the average rise beats the other three combinations of Adam and Eve. Another example: Adam & Adam double tops have the lowest failure rate of the four combinations of Adam and Eve double tops. When your son or daughter asks about Adam and Eve, you now have a wonderful bedtime story to tell them.